TO A NATION enthralled by the heroic exploits of the Mercury astronauts, the launch of Lt. Cmdr. Scott Carpenter on NASA?s second orbital space flight was a renewed cause for pride, jubilation and celebration. Within hours, that excitement had given way to stunned disbelief and anxiety as shaken broadcasters began preparing the American public for the very real possibility that an American astronaut and his spacecraft may have been lost at sea. In fact, it had been a very close call. Completely out of fuel and forced to manually guide Aurora 7 through the frightening inferno of re-entry, Carpenter brought the Mercury spacecraft down to a safe splashdown in the ocean. In doing so, he controversially overshot the intended landing zone. Despite his efforts, Carpenter?s performance on the MA-7 mission was later derided by powerful figures within NASA. He would never fly into space again. Taking temporary leave of NASA, Carpenter participated in the U.S. Navy?s pioneering Sealab program. For a record 30 days he lived and worked aboard a pressurized habitat resting on the floor of the ocean, becoming the nation?s first astronaut/aquanaut explorer. 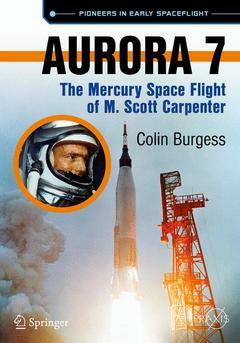 Following extensive research conducted by noted spaceflight historian Colin Burgess, the drama-filled flight of Aurora 7 is faithfully recounted in this engrossing book, along with the personal recollections of Scott Carpenter and those closest to the actual events. A replacement astronaut.- From Colorado to the Cape.- Training for MA-7.- Aurora 7 in orbit.- A highly troubled mission.- Walter Cronkite: “We may have lost an astronaut”.- Post-flight repercussions.- Epilogue: From astronaut to aquanaut. Colin Burgess's first book, “The Diggers of Colditz” was published simultaneously in the U.K. and Australia in 1985. He has written a number of books on the subject for the University of Nebraska Press and Springer-Praxis. The books written or co-authored for Springer-Praxis are “NASA’s Scientist-Astronauts,” “Animals in Space,” “The First Soviet Cosmonaut Team,” “Selecting the Mercury Seven,” “Moon Bound,” “Freedom 7” and “Liberty Bell 7.” He is also series editor and sometimes author for the Outward Odyssey series of books on the social history of space exploration for the University of Nebraska Press.